"amazed me thanks to its freshness and to its particular mix of techno and 70s electronic music." - Chain D.L.K. Hey all it's Seven Octaves aka Kenny MacKenzie. I'm a Long Island boy; now a transplant to paradise, aka Florida. I've been doing this electronic thing off and on for a long while. I started recording as Seven Octaves in September of 2005 for what would become the "Snow Frogs" ep (2006). I'm fairly arrogant so I wasn't surprised at it's acceptance on college radio, lol, but I was thrilled nonetheless, and inspired to make my first full-length album "Simple Work" (2008). The time between releases was due partly to me also being a jazz pianist, and putting out albums in that milieu. In the summer of 2009 I moved down here to FL. A Christmas music connoisseur, (the hokier the better) I wanted to make my own contribution. Thus was born "Nativity Set" (2009). I found the first year or so in FL pretty darn lonely (thank God for FB!) so I let the loneliness be my muse for the next release "Encouragements" (2011); the most successful release to date; doing particularly well in Canada, and being picked up by the awesome nightly show "Undercurrents"; a nationally syndicated program that played tunes from the album a few times a week for over a year. The last 2 years I've been busy with a podcast (Palm Coast Jazz) and a radio show (Jazz Greats on WFCF) and needed a break from home recording. I managed to get 2 more Christmas tracks out and a collaborative single ("Meditation in C") with Italian saxophonist and friend Emanuele Coluccia. Currently, I'm back at it, finishing up tracks that have been in progress for 1-2 years, and inspired to make a new full-length. I'm finding my sound evolving away from attempts at dance music (which I never really achieved) and motoring on to electro-funk and rock. Meanwhile - anything I finish up this year will be released digitally for free - to thank any fans who are still interested in what I'm doing. Sarah Vaughan fully embraced the best pop music of her lengthy career, and her 1966 release "The New Scene" is ample evidence - buoyed with exuberant and thoughtful interpretation. It was this enthusiasm that inspired and fueled jazz pianist Kenny MacKenzie (aka Seven Octaves) to recreate the album instrumentally - with brand new and often exotic arrangements that borrow elements from 1950's space-age pop. This is the first time Kenny has merged his seemingly disparaged musical careers. As a pianist he has most often recorded his own compositions in trio or quartet format - striking a note with many radio stations; receiving generous airplay nationally and abroad with releases like "There You Are" & "Moved". As Seven Octaves in an entirely different milieu he scored several #1 slots across college radio in America with releases like "Simple Work" and "Encouragements"; the later in regular rotation on the nationally syndicated nighttime show "Undercurrents" for two years. 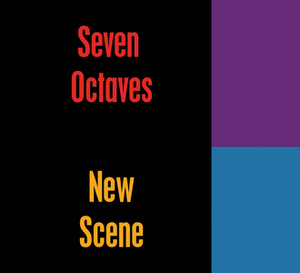 In episode 839 of Punto Radio's "ANIMAJAZZ", for tonight - Tuesday 6 November is Seven Octaves - 'Who Can I Turn To' from 'The New Scene.' Sarah Vaughan fully embraced the best pop music of her lengthy career, and her 1966 release "The New Scene" is ample evidence - buoyed with exuberant and thoughtful interpretation. It was this enthusiasm that inspired and fueled jazz pianist Kenny MacKenzie to recreate the album instrumentally - with brand new and often exotic arrangements that borrow elements from 1950's space-age pop. This is the first time Kenny has merged his seemingly disparaged musical careers. As a pianist he has most often recorded his own compositions in trio or quartet format - striking a note with many radio stations; receiving generous airplay nationally and abroad with releases like "There You Are" & "Moved". As Seven Octaves in an entirely different milieu he scored several #1 slots across college radio in America with releases like "Simple Work" and "Encouragements"; the later in regular rotation on the nationally syndicated nighttime show "Undercurrents" for two years. 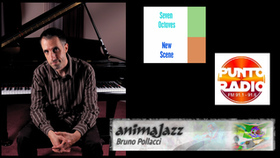 "ANIMAJAZZ" is conceived and conducted by BRUNO POLLACCI and airs on Pisa Italy's Punto Radio.